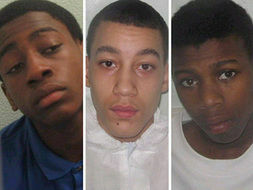 These chaps were all sentenced this week for murder; their victims include Kodjo Yenga, 16, Neil Williams, 41, Paul Erhahon, 14, and Andrew Owen, 42. Only Erhahon's killers have not been pictured in the papers. 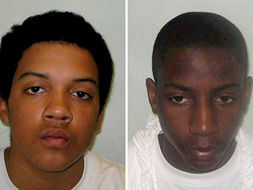 They are aged between 16 and 19. So. 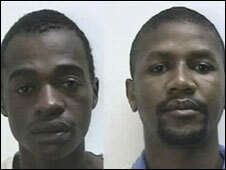 A baker's dozen killers go to jail this week for muggings and street violence that ended in death. How many of them, I wonder, grew up without their biological father present? Some 57% of black kids in the UK grow up without their dads, and the effects are well documented. When are we going to learn that the 60s liberalism that Labour so naively support through the tax and benefits system is costing us billions and doing deep harm to our nation and society? Oh dear. The papers this morning are full of stories that illustrate why the police are incapable of managing themselves, why they shouldn't be run as the national State Police by the government and why we desperately need to take them back under local control. The first is of a man who spent 18 hours in a police cell and had his fingerprints and DNA samples taken after being arrested by five plods for allegedly dropping an apple core in the street. No doubt they feared he would cause distress and alarm to the immigrants driving on the street without licence, tax or insurance or that he would frighten the gang of thugs peddling skunk from under the nearby Macdonalds canopy. Secondly is the tale of a pederast police inspector who would make young men strip and expose their parts to him whilst they were being cautioned for drug dealing, theft, robbery and suchlike minor offences. The real question is why his behaviour went unremarked for so long; it was not until a teenage cycle thief, who remarkably seems to have had two parents at home rather than the usual one, complained about it that the matter came to light. A further dozen youths then came forward to confirm that, yes, they had undergone the same procedure. But presumably had considered it so perfectly normal that they hadn't thought to question it. And there may be another score or more youths who provided ex-inspector Gerard Hutchings with his kicks but are too illiterate to have read the appeals to come forward. Still, there's always the 63 year old postmistress to prosecute for whacking some young scrote around the ear with her parish council minutes. She was cultivating the village flowers for Britain in Bloom when they were exercising their 'Yuman Rights' to kick a ball around carelessly and destroy these symbols of local pride. The concept of hysteresis is one of the most interesting in economics. It is also one of the most complex. 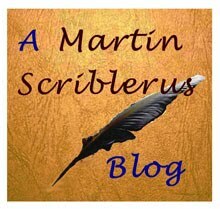 To give a flavour of it in a brief blog post, you will excuse me for simplifying a little. The economic cycle acts on individuals, firms and on the public sector. During recession, firms may downsize staff and rationalise costs and stay in business. When recession ends, their trading activity may return to previous levels, but their use of human resources probably won't; they'll be making and selling the same number of widgets as before but with fewer staff. IT, technology, flexible working, outsourcing some elements of production will all have been exploited to maintain competitiveness. This effect tends to erode during the boom phase as the firm becomes less efficient and then is repeated at the next down phase of the economic cycle. The public sector reacts much more sluggishly, if at all, during the down cycle but will tend to expand during periods of growth. Over time, the tendency of the public sector is to employ more and more people because it never fully sheds load during recession. The key to managing the process is to maintain tight constraints on public sector growth during boom periods, or privatise large sectors of the public sector. Right. So how does this affect Labour, you ask? Well actually, it affects the Tories just as much. And the Lib Dems. Labour's voting membership - members less than six months in arrears with their subs - was probably at or under about 150,000 before the May elections. They have been losing about 20,000 members a year. The 10p tax debacle and other voter anger will no doubt have caused a further haemorrhage in membership. Now suppose Labour recovers in the opinion polls, that they launch a slew of populist policies, dismantle the worst excesses of Zanu Labour control freakery. Will those members come back? Nope. All the parties are losing members rapidly, and even the Tories' current high standing in the polls isn't reflected in hordes of people queuing up to join. Each swing of the political cycle sees the parties with fewer and fewer members. That's hysteresis. But whereas a firm that continually adapts through innovation can succeed with fewer and fewer people making the same number of widgets (to a point where they will merge, takeover other firms, expand into other areas, vertically or horizontally integrate and so on) a political party can't survive without members. Or rather, can only survive the hysteresis by cushioning against the effects of the political cycle in the same way as the public sector cushions against the economic cycle - by subventing public funds. Don't expect the State Funding issue to go away this summer - it will be high on Gordon Brown's agenda. It is salutary to remember that Hillary Clinton was barely a year old when one of the most interesting trials of German war criminals came to an end in 1948. Following the main Nuremburg trials, a series of other tribunals followed that judged the smaller fish in the Nazi reign of terror across Europe. The trial that has become known as the Hostages Trial tried the senior German officers commanding in the Balkans and Greece. The charges revolved around their taking and shooting of hostages in reprisal for partisan attacks against the occupying German forces. Oh, no contest, you might think. Guilty. But not quite. The defendants pointed out that both British and American military manuals allowed for the execution of partisans, the taking of hostages and reprisals against the civilian population. The judges wriggled. In the end they judged that yes, this was true, but the Germans had been over-zealous in applying the principal. Field Marshal List and his generals served a year or two in prison and were released. The judgement of the tribunal is worth quoting in part. It may be read in full HERE. An examination of the available evidence on the subject convinces us that hostages may be taken in order to guarantee the peaceful conduct of the populations of occupied territories and, when certain conditions exist and the necessary preliminaries have been taken, they may, as a last resort, be shot. The taking of hostages is based fundamentally on a theory of collective responsibility. The effect of an occupation is to confer upon the invading force the right of control for the period of the occupation within the limitations and prohibitions of International Law. The inhabitants owe a duty to carry on their ordinary peaceful pursuits and to refrain from all injurious acts toward the troops or in respect to their military operations. The occupant may properly insist upon compliance with regulations necessary to the security of the occupying forces and for the maintenance of law and order. In the accomplishment of this objective, the occupant may, only as a last resort, take and execute hostages. For many years before finding this judgment I have condemned Israel's behaviour in the occupied territories as being in breach of Articles 42 to 56 of the 1907 Hague Convention. Illegal collective punishments, bulldozing villages, cutting off Palestinian water supplies, destroying the local economy, destroying the means of agricultural production, destruction of and wilful damage to cultural or religious property, unlawful seizure of land and property and all the rest of the loathsome abuses by the Israelis in occupied Palestine were, I imagined, illegal. It now seems that there are a number of get-out clauses which the Israelis have learned well, not just from German field marshals such as List but from British and American military law. Why is it in the UK that it's by-election but Byelaw? 'By' I think is from the Old Norse for settlement. Anyway, Let's hope the Fist has scheduled a full day in Crewe and Nantwich to show his support for Tamsin Dunwoody and that he gets maximum publicity. Tory HQ may even like to lend the Labour team some photographers and videographers showing Gordon raising hands with Tamsin etc. etc. In an echo of Major's cone hotline, the government are to spend £44m to set up a bonking hotline to enable people to text the government for help if they suspect their partner of rumpy-pumpy. Robert Whelan, deputy director of the think-tank Civitas, said: "It seems you can't get away from the government - every intimate moment of your life the state wants to be in there telling you what to do. "Electronics are wonderful in their place but you can't expect them to tell you how to cope with your wife's adultery. That's a bit beyond the scope of text messaging." In the Alice in Wonderland world of Zanu Labour, that £44m is about 25% of the extra amount the government have put into enhanced flood protection for the nation. The Commons Environment Food and Rural Affairs Committee published their report yesterday on, amongst other things, the risks to critical infrastructure such as power and water supplies of flooding. Extreme climate events are increasing, and the UK should expect more frequent floods, we are told. Vital infrastructure such as electrical distribution hubs should be protected. Fine. Now, London's power supplies are already stretched as thin as silk. It's all very well for Labour to want to build a new city the size of Leeds in the Thames Gateway, and to boast of regenerating 25% of London with the Olympics, and for Livingstone to have smugly predicted millions more Londoners by 2016. What is lagging is how all this power-hungry development is to be supplied with electricity. Mitsui Babcock reported two years ago of the dangers to London's power. By 2012, 9 out of the 12 nuclear power stations will have closed. 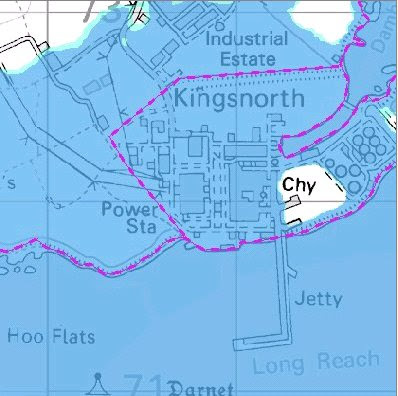 The EU have decided that our two coal-fired stations should close - though Kingsnorth on the Medway could stay open until 2015, and much longer if we ignored the EU. Kingsnorth, with a generating capacity of 1,985MW, is London's power station. It supplies about 4.5% of the UK's electricity. Grain, an oil-fired station, provides another 3% of the UK's power and also powers London. If either were out of commission, London would be in blackout. There's only one little problem with these two critical power plants. 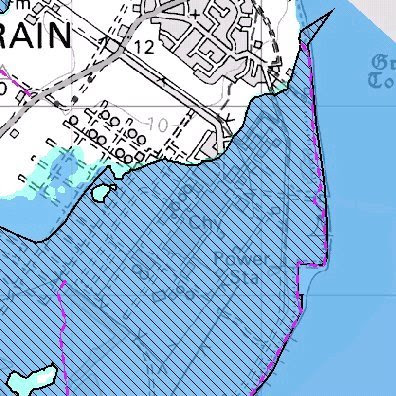 The EFRA select committee doesn't make any mention of it - I suspect it's too scary to contemplate - but the answer is available on the Environment Agency's website flood risk maps. Yep. A week of torrential rain followed by a high spring tide and a North Sea storm surge and London's power supply is gone. Labour's ten years at a time of economic boom have squandered billions in a tsunami of cash for ineffective short-term political objectives but have left the nation ill-prepared for the very tangible threats we are facing. Investment in infrastructure and defence have been farcical. Scared? I am. Anthony Eden or Florence Foster-Jenkins? 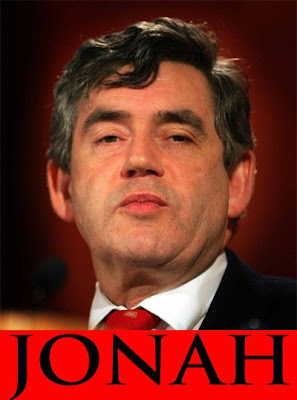 Over the past week several bloggers and journos have compared Gordon Brown to Anthony Eden in a vague and veiled sort of way. I'm not quite sure if they mean that Brown has now supplanted Eden as Britain's worst Prime Minister, or if they are hinting that like Eden he is as high as a kite on pharmaceuticals (speed in Eden's case). In any event, I think the comparison is an invidious one. Before he became an incompetent PM Eden was a reasonably useful bloke. 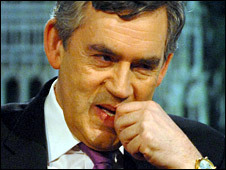 Brown has always been incompetent - a half-trained chimp could have run the Treasury during the boom, but only Brown could have lost the country billions by flogging off the gold reserves at a time of an all-time low in gold prices. No, I think the comparison should not be with Anthony Eden but with Florence Foster-Jenkins. All her life Foster-Jenkins wanted to be a professional singer, but there was a slight problem. She couldn't sing. Wiki says "(she)became famous for her complete lack of rhythm, pitch, tone, and overall singing ability." From her recordings, it is apparent that Jenkins had little sense of pitch and rhythm and was barely capable of sustaining a note. Her accompanist can be heard making adjustments to compensate for her tempo variations and rhythmic mistakes. Her dubious diction, especially in foreign language songs, is also noteworthy. Nonetheless, she became tremendously popular in her unconventional way. Her audiences apparently loved her for the amusement she provided rather than her musical ability. Critics often described her work in a backhanded way that may have served to pique public curiosity. Despite her patent lack of ability, Jenkins was firmly convinced of her greatness. She compared herself favorably to the renowned sopranos Frieda Hempel and Luisa Tetrazzini, and dismissed the laughter which often came from the audience during her performances as coming from her rivals consumed by "professional jealousy." Brown is so utterly devoid of every quality required in a Prime Minister, and in this period of his final decline into dismissal by the British public also almost politically impotent, I for one am now going to settle down to some fun and amusement from watching just how inept he is. He is truly the Florence Foster-Jenkins of the age. We popped into Rochester yesterday at the end of the weekend to catch the tail-end of the Sweeps' Festival - a glorious three-day Kentish bacchanalia. 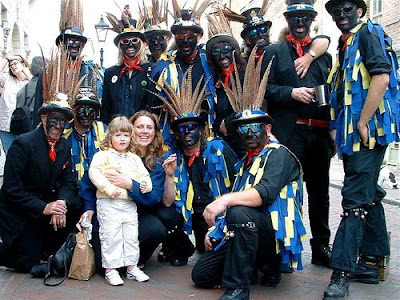 The various competing troupes or tribes of sweeps - and there are many - are like Morris Men. Except in black. And a bit sinister and scary. Well, chimney sweeps would be. Accordians and massive new-age drums overlain with the staccato clash of sticks and clearly a tremendous load of fun being had by all. The sheer wonder and delight in the eyes of a young Asian lad watching with his puzzled family made me feel very proud that the Brits still have thriving cultural traditions such as this. Out on the boat yesterday and in magnanimous frame of mind, I determined to put the vast weight of economic and administrative incompetence from Labour over the past 11 years aside and think really hard about Labour reforms that in any way have made my life better. I came up with 3. I grew up in London's museums. Bloomsbury and South Kensington were as familiar to me as the fields and woods where I lived; even a rattly old tube ride to the Elephant would bring the reward of a whole day lost in the IWM. Museums are one of the most effective forms of education that there are. From the 1990s on, for a variety of reasons, the nationals began charging. Audiences plunged. From around 2001 Labour did away with the need for charges. An excellent and enlightened government move. OK, this is probably one that Labour now regrets having brought into law - and hated by loathsome Tory dinosaurs such as David Maclean MP. However, it's hard to see now it's here that they can take it away. Yes, let the light shine into every aspect of the State. Hmm I may be scraping the barrel a bit here. I may be swayed by the fact that I got mine free - an example of the sharp elbows of the middle classes taking advantage of one of Ken's rare when-they're-gone-they're-gone offers. Always keep a few quid on it for those unexpected little journeys, thereby avoiding the 'tourist tax' that in effect is what London Transport cash fares are. Has The Fist got jaundice? Is this rampant jaundice, or just the Great Wanking Fist's inept application of the wrong (sooo wrong) shade of makeup? I'll bet the lasses in Crewe and Nantwich could give him a few lessons. Mind you, I don't reckon the lads from Crewe and Nantwich RFUC would be that impressed. Ian Blair was reported to be as white as a sheet yesterday when Boris took him aside for a private chat. He was also reported to have been terrified of being filmed clapping the new mayor too enthusiastically in case his Downing Street boss picked it up. Ten years of Zanu Labour and this is what it's come to - an apparatchik police chief scared of his own shadow who has hooked his star to the waning red dwarf of the Great Wanking Fist. It's the Alice in Wonderland Polly Toynbee world of Labour values that puts the prosecution of litterers and yellow-line parkers above the preservation of the lives of our city's kids, one of whom is murdered every fortnight. Boris' priorities are exactly the right ones. As yet another 15 year old lad lies in the mortuary fridge with knife-rent vitals our common humanity demands that we apply all our resources to slow and halt this evil scourge. Boris can do whatever he can with the Met, but it will not be enough. Civitas have reported in depth on the proximate reasons for this carnage of the kids; some 57% of black kids are growing up without their biological fathers. Gordon, please listen to me. The State is not an adequate father substitute. 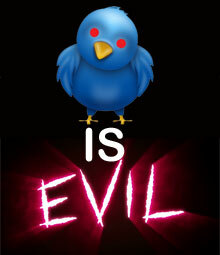 Rousseau was wrong. Boys need fathers. Children need families. Single parenthood is not a valid lifestyle choice - it's an open door to deliquency, violence, poverty, idleness, squalor and death. It will need more than Boris' grip on Ian Blair's scruff to change this course. But it will be a damn good start.